I just picked up a 3 dot (triangle pattern) Luke FB saber and was wondering if anyone had any idea about the history. When I searched around, I only found a FS thread from Oli (oilsuds) with one and when chatting with him, his thoughts were that is was an early, pre-lettered saber. That certainly makes sense to me. And, as Oli pointed out, the color and material seems to more along the lines of standard DTs when compared to the regular ST lettered sabers. Does anyone have any more knowledge/history of this type of saber? Any thoughts or insight would be appreciated! I am barely getting into the history of lightsabers but yours looks very awesome. Unfortunately I don't have any Luke's sabers but it could be something very special. I hope one day we'll find out more on it, but so far the only interesting bit about it is that Oli (olisuds) was the only other person that had one and his stuff is usually interesting to say the least. As he said, and my gut agrees, its probably an early saber before the lettered 'A' sabers (i.e. possibly 1 dot, 2 dots , 3 dots then the lettered 'A', 'B', etc ). If true, its pretty cool and that would just make happy. It sure would be a nice stepping stone between my circles DT, regular DT and an 'A' saber. I do like it no matter what though. but i can say that it is a real tuff bugger to find. Have on two (at minimum) in yellow....so this is no repro I guess?? Sorry...just sorting my lightsabers..and its a mess!!! I definitely am leaning towards original just based on comparisons to the lettered sabers and DT in color and material... plus it is a flat tip which makes me more satisfied that it more than likely is legit. And after seeing Oscars red one, I am even more convinced. My next research project I want to do is to sort out which sabers shipped with what COOs to pair them up better where possible. I am lucky enough to have intact sabers for all my farmboys right now, so I hope after the research, I won't need to acquire too many others just to pair them up properly. Stupid little buggers can get expensive when you have a ton of Lukes! You have two, Wolff... Any ideas on what figures yours came with or are they just pickups over time? Mine was picked up without a figure so I have nothing but a guess which COO it could have been shipped with if 100% legit. the damn coo collecting made me swaping most...and....a lot of tips broke in time. I am in for that research...I hope to find a little sparetime soon to make some group shots! and a third one with flat tarnsition! If you get a spare couple of minutes, could you throw up some pics of your repros for us to have a look at, as I have not seen a confirmed repro flat transition saber. Not good news about repro flat tips! My plan is, when I have time, is to take pictures like I did for Leia's blasters to start my internal sorting. FOr the blasters, I used a comic book backing card, folded into thirds so it would stand up straight and used double sided tape on the middle section and gently pressed the blasters to the tape. It made focusing and consistency a breeze and yielded my best, close up detail shots to date. I just need to make the time to set the shot up to start with. That's the easy part - documenting what I have. The hard part - pouring over 1000s of pictures from ebay, TIG, RS, Google, etc, finding every baggie and MOC and hoping for good, HQ shots of the sabers. And maybe a little help from MOC collectors snapping some good closeups. One day... hopefully sooner rather than later I'll get to that. hmm...now I am confused....as siad in the other thread: I thought flats are bullet proof. The real flat one I saw was posted by AJ somewhere...but checking the pic again it is probably a revalveit DT..and not single telescoping....?!?!? So good for us: flats are safe?!?!? I am going through some pictures now to see if I can find it, but man, I think I did find a repro flat tip yellow saber earlier this year. I am not positive though. What I do know is that I sent it over to John (db) for the Gunnery reference along with a few other repros (Leia cape) and a couple other blasters which I can't recall now. 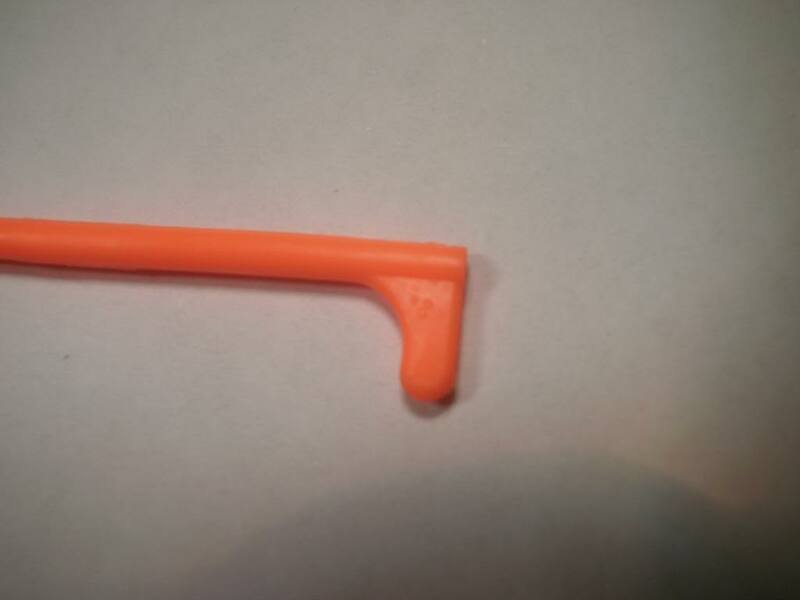 Not sure if John still has them kicking around to see, but if I am right in my recollection it was a flat tip, bright yellow molded, not painted, very stiff and brittle - so brittle the tips broke easily and I had about 3 of them all from the same seller on ebay. I may have even had a blue and red one too. They might have been round tips, but man, I just can't recall. I hope my memory is just playing tricks on me. I'll keep digging through the mounds of photos I have, but back then I wasn't good at documenting everything as I am now. Fingers crossed I am confused and wrong! IMO these are not really flat, but well. The handle is unique...compare to the painted ones! Wolff If that middle obi-wan saber in AJ's pic, which has the semi flat transition, is a repro. Then presumably whoever produced it would have used the same mold for all three colours. So therefore they will all have the same transition sculpt, making it easier to spot. You said above that you may have this particular repro in your collection, perhaps you could take some high quality pics, so we can see the differences more clearly.